Putting kids to work on meaningful projects can transform classrooms into beehives of inquiry and discovery, but relatively few rigorous studies have examined how well this teaching method actually works. An encouraging new report describes preliminary, first-year outcomes from a study of 3,000 middle school students that shows kids can, in fact, learn more in science classrooms that adopt a well-designed, project-focused curriculum. Students participate in the same basic ways that scientists would, with activities organized by important “driving questions” that are relevant in science but also meaningful for kids. How well the benefits hold up or grow in the second year of implementation remains to be seen. But the researchers see project-based inquiry learning as a promising strategy for helping school systems move toward new U.S. science education standards that were released last year. To move beyond the rote memorization of disconnected science facts that traditional instruction tends to emphasize, in 2011 the U.S. National Research Council laid out a new framework for revamping K-12 science education. The Next Generation Science Standards embody that framework and aim to teach kids some of the core thought processes and practices that scientists and engineers use to investigate natural phenomena and solve problems. Meeting those new standards will likely require a considerable shift in how schools teach science. 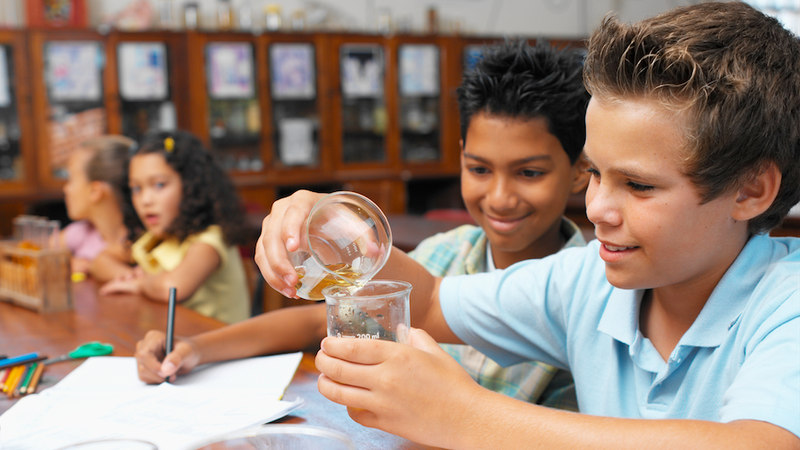 Project-based inquiry learning programs seem well suited to be part of the solution: They get students to participate in educational projects in the same basic ways that scientists would, with activities organized by important “driving questions” that are relevant in science but also meaningful for kids, Harris said. One such curriculum for grades 6-8 is Project-Based Inquiry Science (PBIS). Originally developed in the ‘90s at several universities with funding from the National Science Foundation (NSF), it incorporated the latest research knowledge on how students learn and how teachers can best teach them. An education publishing company named It's About Time brought the curriculum to the commercial market. Currently, PBIS is one of the few curricula available that are fully aligned with the new science standards, and its structured activities emphasize core practices such as carrying out investigations, constructing science explanations and developing and using models. For instance, one physics project poses the driving question, “Why should I wear a helmet when I ride my bike?” – an inquiry that’s compelling because it connects directly to kids’ everyday lives, Harris said. To answer it, students work on a series of activities leading them to explore related questions that build their knowledge of the principles of force, motion, acceleration and gravity, so that they can grasp how a helmet would protect their heads from the impact of a potential collision. With guidance from their teacher, “they're conducting investigations, but there's also supports for kids to collect data, organize it, analyze it, share it, debate it, argue about it”—similar to how real-life scientists work, he said. In an SRI research effort funded with a $5 million NSF grant, Harris recently conducted a randomized controlled trial of whether the PBIS materials are effective. Project collaborators included William Penuel of the University of Colorado and Joseph Krajcik, a Michigan State University professor who helped develop the new U.S. science standards as well as the original PBIS curriculum. The experiment took place in sixth-grade science classes at 42 middle schools in a large, ethnically diverse urban public school district during the 2012-2014 academic years. About 55 percent of the pupils were eligible for free or reduced-price lunches. Half of those schools adopted PBIS curriculum units for physical science and earth science, with their teachers going through professional development training (provided by It’s About Time) in project-based teaching and the next-generation science standards. The rest of the schools taught science the traditional way, but their instructors also received training in the new standards. Almost 100 teachers and more than 3,000 students participated. On average, kids in the project-based physical science classes performed roughly 8 percent better on an end-of-unit learning assessment than the kids in traditional classes. (Because the course content was new, the researchers also had to create entirely new assessment tests, which required a lot more demonstration of critical thinking skills than standard multiple-choice science tests.) That’s an improvement that would lift a student who scored in the 50th percentile on the test to the 58th percentile – a gain that “is actually really good for an education intervention,” Harris said. Pupils in the PBIS earth science classes showed a similar trend toward stronger scores, but that increase wasn’t statistically significant. The research team is now analyzing data from year two and will evaluate how well teachers implemented the project-based curriculum. While the approach clearly engages students more, potential barriers to its wide adoption include the fact that it is resource intensive, Harris said. School districts have to buy not just the book and teacher’s guide but also the materials for classroom activities. Each PBIS unit costs roughly $23 per student. And teachers need substantial training, including support throughout the school year, to learn how to coordinate kids to collaborate well on projects, and to ensure that important scientific concepts bubble up and get discussed. So project-based learning is generally a huge investment for school districts and more work for the teachers, but many of them “find that the hard work pays off,” he said. Harris hopes to see more project-based science curricula coming out that are keyed to the new standards and grounded in research on learning. Such materials are badly needed in elementary schools, because too many children don’t get exposed to good science instruction on a consistent basis until middle school, he said. Catching kids earlier to help them see the big picture of what science is about could spark their excitement – and perhaps inspire new generations of young scientists from diverse backgrounds that STEM disciplines are greatly in want of.